Easter is only days away! If you're still looking for some great gifts, I've got you covered! 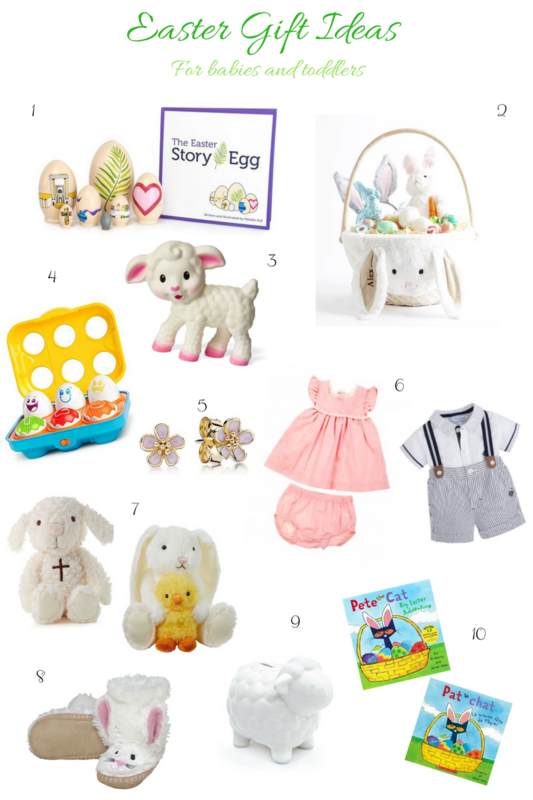 From babies to toddlers, this list has a variety of options for the special little ones in your life! Enjoy! 1. The Easter Egg Story Book with Nesting Eggs - This book and nesting egg set is a great way to teach your little one about the true meaning of Easter! 2. Personalized Easter basket - Not only do these personalized baskets help to collect Easter treats, they make a great keepsake for years to come! 3. Squeeze and Teeth Lamb - This cute little lamb is sure to keep a teething baby happy during the Easter season! 4. Giggling Gourmet Put n' Shake Eggs - These adorable little eggs which make noise as they shake, will help keep your little one entertained! What's more, this set helps to teach your little one their numbers. Try saying the numbers in different languages and it will make for a great language learning activity as well! 5. Cherry Blossom Pink Enamel Gold Stud Earrings - If you're looking for an extra special gift this Easter season, consider these beautiful studs. This gift can also grow with your child, making it a lasting favourite! 6. Girandola Sleeveless Dress and Mayoral Short and Short Set - These adorable outfits from European designers, Girandola and Mayoral, are sure to make a statement at your Easter celebrations! 7. Plush Lamb and Plush Bunny with Chick - These soft toys will surely become your little one's best friends! 8. Bunny Slippers - These cozy slippers will help your little one hop around during Easter! 9. Ceramic Sheep Coin Bank - Your little one will have fun putting their coins into this cute sheep bank. Count as you go along and you have a great learning moment as well! 10. Pete the Cat: Big Easter Adventure - Books are always a great idea at Easter time! This story also has a French version available for that extra language learning!